Brrrrr! It's just the weather for a nice bowl of lovely homemade steaming hot soup - but this Soup Maker by Judge Cookware isn't all about soup you can use it to make hot chocolate, milk shakes, smoothies and to cooks eggs too by using the 4 hole egg cooker attachment. Recently scoring 9/10 in Your Home Magazine for best soup maker. Having been sent one to review myself here's how it went. Now it has to be said I do love me a kitchen gadget or two dozen! So within half an hour of it arriving at my door I was cooking eggs. They turned out perfectly cooked in 11 minutes. The Judge soup maker is so easy to use, once you've gathered your ingredients together you just add everything to the jug (apart from cream if you're using as that gets added at the end of cooking). 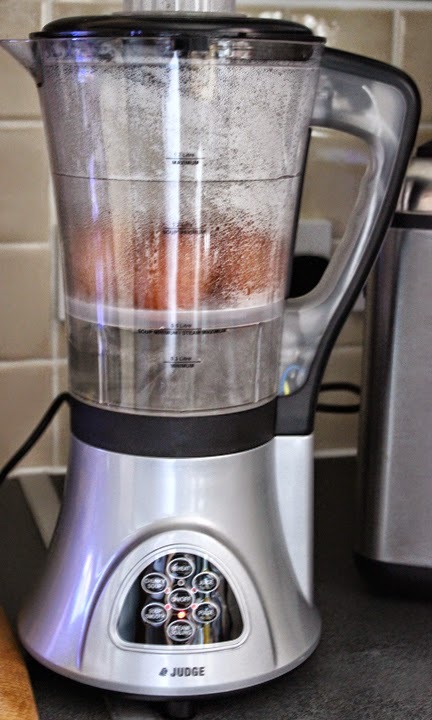 So, in with the ingredients, stock cube and water then at the press of a button your soup ingredients get chopped, whizzed up and cooked in just 20 minutes for smooth soup or 30 minutes for chunky. A nice loud alarm sounds to alert you when your soup is cooked. At the time of writing I haven't actually tried chunky soup but I'll let you know when I do and you can read about it in a second post. 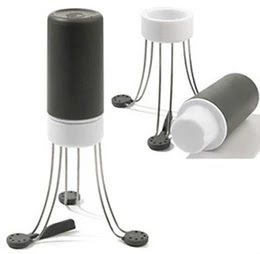 The 300W motor with stainless steel blades whizz up your soup ingredients and are cooked quickly with the 800W heater. I'm seriously impressed with this soup maker and apart from making soup it cooks eggs really well. Paul (the husband) is quite partial to egg and salad cream sandwiches for his lunch when working - I know he's easily pleased bless him! 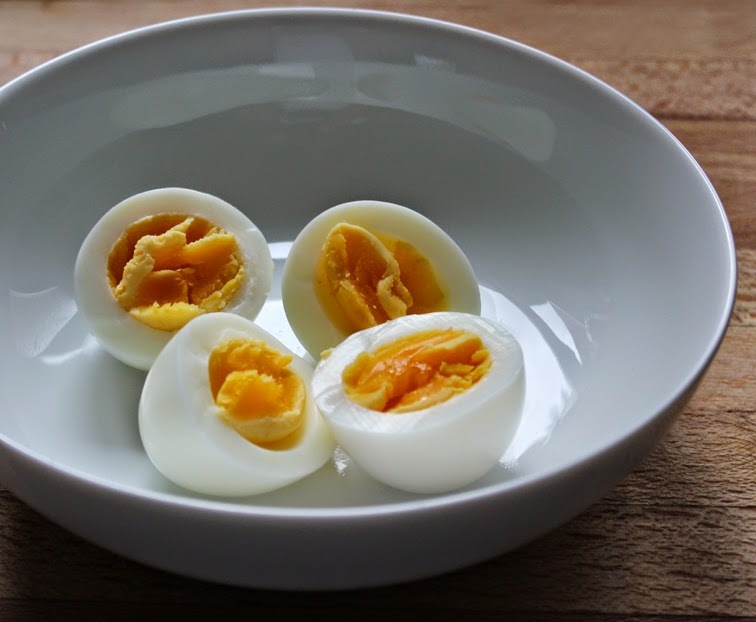 Okay I hear you say, can't you just boil eggs in a saucepan? Well of course you can, but I'm telling you just so you know - this soup maker can do it for you and does a great job too. Fill the jug with cold water up to the MINIMUM mark but not above the Steam Maximum Mark. Pop in the egg basket and add your eggs. Put the lid on along with the fill cap. There's no built in timer for cooking eggs so you have to set a timer. Start the STEAM/BOILING programme and start the timing as soon as you press the ON button - I found that 11 minutes worked brilliantly. After 10 minutes (as the instructions suggest) they were still runny. That said hens eggs vary in size. I don't keep eggs in the fridge and mine are really fresh since we keep hens so that could make a difference with timings. Well here are the eggs - perfectly cooked I think you'll agree? The jug can't be immersed in water but the soup maker comes with a handy brush to make it easier to clean. We live in a hard water area so after boiling eggs a few times the bottom of the jug had a white film over it due the the lime-scale in the water. But if this happens fear not, just pour a little vinegar into the bottom of the jug and leave to soak for a minute and it comes up shiny like a new pin. 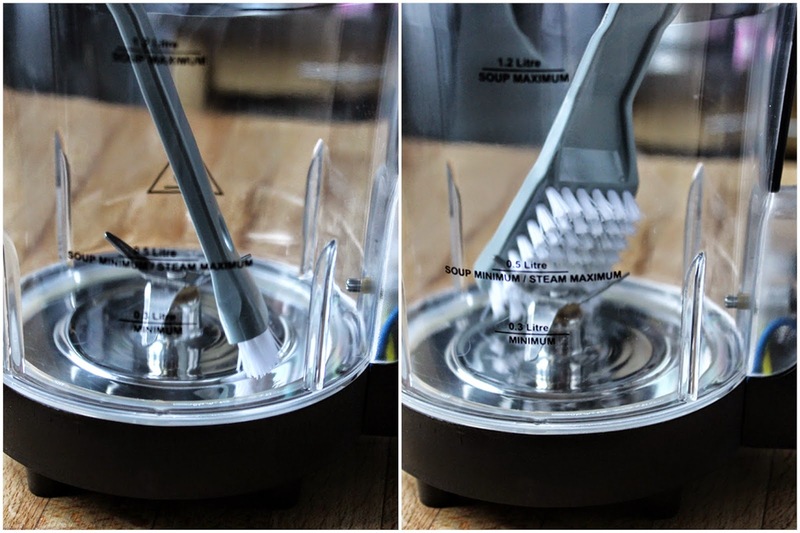 The brush really could do with the end bit being angled so it can reach around the blades, but for cleaning after making soup for example, the PULSE button can be used to clean the jug and does the job really well. Just add warm water and a small amount of detergents to the jug, pop the lid on and 'pulse' for short periods allowing the liquid to clean the machine with little effort. I think this is a fantastic soup maker, it does all the work for you. You don't even have to dissolve a stock cube beforehand, just pop it in along with the other ingredients and of course water and the soup maker gets on with the job. There's a handy recipe booklet included to give you some ideas covering soups, guacamole, flavoured butter, milkshakes and smoothies. I haven't tried chunky soup as yet although I'm sure it will be just fine. 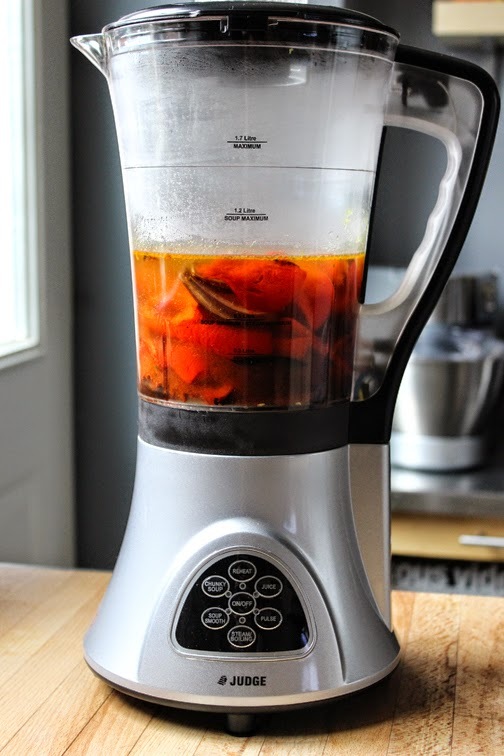 Easy to clean, easy to follow instructions and gives great results as you will see in my next post - Spicy Red Pepper and Sweet Paprika Soup. Yep, I'm loving this soup maker and I'm off now to make more soup! Many thanks to Judge Cookware and @PBMmarketing for sending me this to review. This does sound like a rather handy gadget! Gosh, eggs in a soup maker, who knew? !